You may choose ONE Bonus Design for each set purchased at full price $10.00. You may only choose ONE Bonus Design for a 3 for $25.00 order. Three $10.00 orders $30.00 = 3 Bonus etc. List your selections on the Pay Pal "message to seller" area or send me an email after you have placed your order. Be sure to use the full name of the bonus. BONUS DESIGNS MUST BE REQUESTED WITH IN 48 HOURS OF PURCHASE! Made ITH in one piece. Super quick to make! 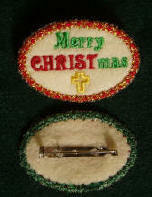 finished size 3 1/4" x 5 1/4"
Make this patchwork ornament in the 4x4 hoop. For 4x4 and 5x7 hoops. Use to attach to the top corner of the refrigerator to keep all medical information easily available to family or paramedics in an emergency. It has a clear vinyl pocket on the front. For the 5x7 hoop. Matches the Book Covers! It has patchwork corners. You can add your own design or wording to the center. For the 5x7 hoop. Easy strip piecing! Made in the 4x4 hoop. Both are included. Made in the 4x4 hoop. It measures 2-1/2 X 1-3/4"
For the 4x4 hoop. An appliqué design that can make a freestanding ornament or stitched on fabric. Make this freestanding applique ornament in the 4x4 hoop. Note this is a stocking ornament only . Not a fillable stocking. For the 4x4 hoops. Blank included with instructions to add your own words. Pins measure 2-3/4 x 1-3/4". Uses a 1" pin back. Give the golfer in your life an elusive "Hole In One". For the 4x4 hoop. Pin measures 2 1/2 X 2 inches. Made in the 4x4 hoop. 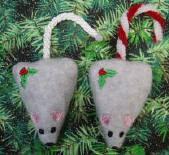 You can make either an ornament or a cat toy with this design. Made of polar fleece. Made in the hoop pin. Full instructions included. Just glue a pin backing to the back or it can be used as an appliqué design. Make this mini bell pull ornament in the 4x4 hoop. Use as an ornament or bookmark. Make a freestanding Ribbon Pin in any color you want. 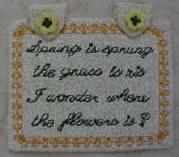 This is an appliqué design that can be stitched on items OR used to make a Ribbon Pin. Full instructions included. For 4x4 hoops. This quick little project can have two uses. One is to carry a small plastic bag in your purse to bring home that muffin or roll that you can't finish but know your be craving later. The second use is to carry a small plastic bag to use to clean up after your pup when your out for a walk. You can enclose a loop of ribbon in the top of the seam to add a clip to. Then you can clip it onto your dogs leash so your always ready! Made in the 4x4 hoop. Made in the hoop. Full instructions included. Glue pin back to the back to finish. This one is for the 4x4 hoop. The backing is all sewn on by the machine. Just glue a magnet to the back. A blank version is also included so you can add your own wording. 4X4 hoop Merry Christmas and blank version included. 4x4 hoop Blank version also included. Shown made with fleece, felt and cotton calico. For the 4x4 hoop. Pin measures 1 1/2 X 1 1/2 inches. For the 5x7 hoops only. Created entirely in one hooping. Blank version included so you can add you own designs or quotes. For the 4x4 hoop. The tabs on this one are folded to the back for a different look. Blank version included so you can add your own design or quotes. For the 5x7 hoops only. Finished in one hooping. Full detailed instructions included. This one comes in both 4x4 and 5x7 size. It is done entirely on the embroidery machine. No measuring, just lay strips of fabric over the stitched guidelines. The whole project is done in one hooping. Including stitching the back on. The pictures don't show the the corner blocks very well. They are set in folded squares. Full detailed instructions included. This one also comes in both 4x4 and 5x7 size. It is done entirely on the embroidery machine. No measuring, just lay strips of fabric over the stitched guidelines. The whole project is done in one hooping. Including stitching the back on. Full detailed instructions included. The embroidery designs on this site are copyrighted and are intended for the personal use of the individual downloading it. Reproduction or distribution of these designs, to any third party is strictly prohibited. The designs may be used in the production of goods for resale. If you would like your friends to have the designs, please send them to my site. Thank you for your cooperation.